BEXAIR Challenger-601 3R aircraft is the last of the CL-601 series built, with the benefits of its hallmark wide-body concept, with a spacious cabin and luxurious interior. 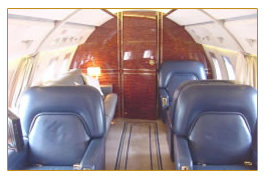 This 10+1 seat Challenger aircraft has intercontinental range. With its wide cabin and tasteful interiors, this aircraft is a solution to your travel needs giving you peak performance.